I remember reading Harry’s article on “Gender Gap in Pay, Recognition and Rewards” with great interest. His article pointed out inspirational women who have set examples of leadership in today’s very competitive marketplace. I found it odd that I hadn’t heard of some of these women, but then again I’ve always been more likely to be inspired by the real-life people that walk through my life—from my high school locker partner who wanted to drive race cars and did … to the employee of a client who bulldozed through the bureaucracy and made things happen. No person, either famous or in my life, inspires me more than my grandmother, who just turned 100 years old. More than once, she has demonstrated determination and a strong work ethic just in the last five years. Needless to say, her life has been filled with moments of resilience, and it wasn’t until I set out to do a small slide show for her birthday celebration that I saw this in action. Developing a slide show for an active woman celebrating more than 100 years was more time-consuming than planned but well worth the time. With help from family who looked through photo albums, we scanned about 100 photos and articles. Fortunately, some of the more recent photos were already in digital form. First, I scanned the photos at 300 dpi for the family so that everyone would have a high-resolution graphic that could be printed if necessary. Second, I set the resolution to 72 dpi for the slide show. Third, I imported the photos into the free Microsoft Movie Maker, added transitions between photos, and added music. Fourth, I created a CD label with the free Avery DesignPro software. I gave every family member a CD with the slide show and the higher-resolution photos. Last, I created a DVD cover with the free Memorex exPressIt software to hold the CD. The added benefit of the slide show was that the photos themselves inspired my grandmother to give detailed descriptions of each photo, including describing the color of her dresses in those old black and white photos. What a memory! In the end, it was a positive project for everyone to see how different the world was in the early 1900s when photos were in black and white, computers didn’t exist, and you couldn’t travel around with your phone in your pocket. And I thank the subject of the slide show, my grandmother, a woman who still demonstrates her determination on a daily basis. What an inspiration! 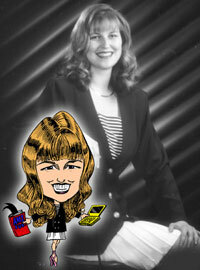 Melanie L. Drake focuses on the publishing and marketing sides of the AchieveMax® company. AchieveMax® professional, motivational speakers provide custom-designed keynote presentations, seminars, and consulting services on change management, creativity, customer service, leadership, project management, time management, teamwork, and more. For more information on AchieveMax® custom-designed seminars and keynote presentations, please call 800-886-2629 or fill out our contact form. This entry was posted in Moment with Melanie by Melanie L. Drake. Bookmark the permalink. Just a word of advice when using stickers to label DVDs. Don’t. DVDs are more sensitive to sticker label adhesive than CDs and can cause data loss. When labeling DVDs it is better to use a newer disc labeling method such as the Dymo DiscPainter labeling device. It prints full color labels directly on a DVD without those data corruption issues.